The Beach House is fully furnished, with a complete kitchen, a large double-bed (shown here) and two bunk-beds. An extra day-bed can be arranged. 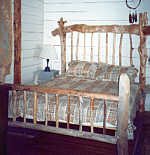 The furnishings are simple and elegant, which many hand-made driftwood pieces.